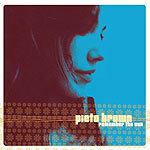 CD review: "Remember the Sun"
The daughter of respected folk singer Greg Brown, Pieta Brown leans more toward the folk-rock and country-rock side of things than Dad does. But she possesses a comparable sense of presence on her new (fourth) CD  she sings with a confidence and directness that holds your attention. And she also writes songs with enough interesting nooks and crannies to also hold your attention. She alternates slower, introspective pieces with uptempo rockers, so the album never hits a rut. Even when she rocks out, though, as on "Sonic Boom," she sings with a laconic refusal to rush that somehow gives the song even more energy. Combine the lovely pipes with the intriguing songs, and you have a pretty solid outing.